Pakistan’s health ministry has said that if new funds are not arranged for the delayed anti-polio campaign, it is likely to halt after two months, Dawn online reported on Thursday. An health official said that the ministry was running out of funds. The Economic Coordination Council (ECC) was supposed to approve funds for the campaign in the second week of August, but it has not been allocated owing to a political crisis. The Islamic Development Bank, Japan and other organisations were to provide a loan of $326 million, with the interest on the amount to be paid by the Bill and Melinda Gates Foundation, the official said. “If the funds are not arranged in the next two months, the ministry would be left with no option but to halt the countrywide polio campaign,” the official added. In Nov, the World Health Organisation (WHO) will review the temporary travel restrictions it imposed on Pakistan in May, on the recommendation of the International Health Regulations, which made it mandatory for every person intending to travel abroad to produce a polio vaccination certificate at the airport. For now, it is obligatory on the government to vaccinate each person going out of the country, the official said. A total of 115 polio cases has been registered in Pakistan this year. According to the National Institute of Health (NIH), only 39 polio cases were registered last year. Of the 115 cases registered this year, 84 are from federally administered tribal areas, 19 from Khyber Pakhtunkhwa, 10 from Sindh and one each from Punjab and Balochistan provinces. 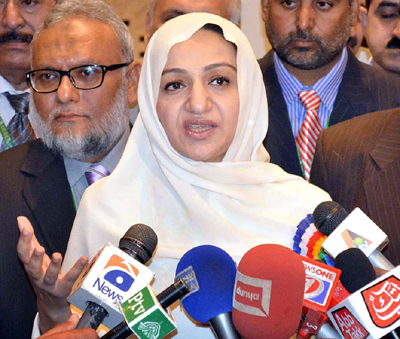 Minister of State for National Health Services, Regulations and Coordination Saira Afzal Tarar on Tuesday said that the government is attaching high priority to strengthening of eye health care system in the country. She was addressing the launching ceremony of three projects included Pakistan Australia – prevention of avoidable blindness project by the Fred Hollows Foundation Australia, strengthening of Pakistan’s response to diabetic retinopathy project by Sightsavers, UK and the regional contaract program CBM Germany, organized by National Committee for Eye Health (NCEH). The minister said after devolution the responsibility is now shifted to the provinces, however the federal government is working on different projects for eliminating avoidable blindness. She thanked the government of Australia for its assistance for reducing blindness in Pakistan and expressed the hope that such support will continue in future also. She appreciated the performance of National Committee for Eye Health and particularly sincere efforts of committee’s chairman. She urged other medical professionals to come forward and play their due role in the development of health sector. Australian High Commissioner Peter Heyward said that the government of Australia is delighted to support Pakistan in health sector and pledged to continue such support in future. He expressed the hope that with start of these projects in Pakistan, the government will be able to achieve the goal of elimination of avoidable blindness in Pakistan. National Coordinator and Chairman National Committee for Eye Health (NCEH), Prof Dr. Asad Aslam Khan said that prevalence of blindness is 0.9% and cataract surgical rate has crossed 4000 per Ophthalmologist per year, meaning that on an average a Pakistani Ophthalmologist is doing more than 10 cataract surgeries per day. He added, teaching hospitals have optometrists, Refractionists, Orthopists, Oph Technicians and 50% DHQ and THQ hospitals across the country are having Refractionists, Oph Technicians working there and post of Ophthalmologists have been created at THQ hospital level in Punjab, KPK and Sindh and are gradually being filled up. He said NCEH made its modest start in 1980 National Eye Camp and gradually evolved through the stages of National Committee for PBL in 1982, NSC For PBL in 1994 to present NCEH in 2008. Dr Asad said that the committee with the generous support of WHO and INGOs FHF, Sightsavers, CMB, SCB, DFID and DFAT worked day and night for prevention of blindness and promotion of Eye health in Pakistan. He said that the committee has been working for up gradation of eye health services in Pakistan on public private partnership with the support of International NGOs like Fred Hollows Foundation Australia, Sightsavers International UK and CBM Germany, AUS AID, DFAT, DFID and Corporate Sector SCB. He added the partnership has resulted in many successful outcomes for the country, including establishment of Pakistan Institute of Community Ophthalmology (PICO), Peshawar, establishment of College of Ophthalmology and Allied Vision Sciences (COAVS), King Edward Medical University/Mayo Hospital Lahore, up gradation of eye departments of all teaching hospitals in countryand up gradation of Eye units of 120 DHQ hospital in the country. He added other achievements included integration of Primary Eye Care in Primary Health Care, National Survey of Blindness and Low Vision 2002-2004, National Survey of Trachoma, National survey of Cataract surgical services, National Survey of Refractive Error services, National Programme for Prevention and Control of Blindness, 1993-1998 and 1999-2004 and 2005-2010 and devolved National Programme for Prevention of Blindness 2012-2015. Two policemen and a polio worker were killed Friday in attacks on polio teams and their police escorts in Pakistan, authorities said. A policeman was killed and another injured when unidentified gunmen fired on a polio security team in Swabi, in northwest Pakistan’s Khyber Pakhtunkhwa province, District Police Officer Sajaad Khan told CNN. One policemen, Ijaz Ali, was killed immediately, while the second, Iftikhar Ali, died a few hours later at a hospital. Both were shot in the head, said an officer who saw their bodies. Swabi is the hometown of Khalid Sheik Haqqani, a senior Taliban official. The officers were there to protect polio workers, who have come under increasing attack in the past year. The second victim, a polio worker, was shot dead by unknown men in Jamrud, in Pakistan’s tribal Khyber Agency, an official said. while returning from dispensing oral polio drops to children, said Muhammad Asif, a local official. Pakistani cricketer-turned-politician Imran Khan, who heads the Tehreek-e-Insaf (PTI) party, condemned the targeting of polio workers in a statement released by his party. Khan called on Khyber Pakhtunkhwa’s chief minister and the federal government to take “strong action” to arrest those responsible and to provide security for polio workers. The PTI party holds the majority of seats in the coalition running Khyber Pakhtunkhwa’s provincial government. Militants have targeted anti-polio campaigns in Pakistan since U.S. intelligence officials used a fake vaccination program to help in their hunt for Osama bin Laden in 2011. Under cover of the programme, the CIA sought to collect DNA samples from relatives of the al Qaeda leader to verify his presence in a compound in Abbottabad. More than 20 polio workers have been killed since July 2012. Some mullahs have also preached against the polio campaign, claiming falsely that the oral vaccine leaves Pakistani children sterile. Last year, a Taliban commander in northwest Pakistan announced a ban on polio vaccines for children in the region as long as the United States continued its campaign of drone strikes. Pakistan stepped up its eradication efforts after cases spiked in 2011, but cases continue to be diagnosed. At least 16 cases of polio have been reported this year in Khyber Agency. Polio, which can cause permanent paralysis in hours, remains endemic only in Pakistan, Nigeria and Afghanistan. Among those strongly opposed to the polio drops project is Mullah Fazlullah, who was recently appointed to head the Taliban after his predecessor was killed in a drone strike. In June 2012, the Taliban announced its opposition to polio vaccination efforts. Since then, there have been more than two dozen deaths involving vaccination teams and their security details. A Pakistani doctor won a $1 million grant on Tuesday to fight early child mortality in a small fishing village in southern Pakistan in a contest financed by an American entrepreneur to find innovative ways to save lives, The Caplow Children’s Prize said. A proposal by Anita Zaidi, who heads the pediatrics department at the Aga Khan University in the port city of Karachi, beat out more than 550 other applications from more than 70 countries. The prize was founded and funded by entrepreneur Ted Caplow to find impactful and cost-effective ways to save children’s lives, according to a press release announcing the results. Zaidi said in a telephone interview that her project will focus on reducing child mortality rates in Rehri Goth, on the outskirts of Karachi. According to Zaidi, 106 out of 1,000 children born in the town die before the age of five. That is almost double the worldwide under-five child mortality rate of 51 deaths per 1,000 live births in 2011, according to UNICEF. Few of the women in the area of roughly 40,000 people have access to medical care during pregnancy or money to pay for things like multivitamins, said Zaidi. There is no nearby hospital, and women usually give birth accompanied by a birthing attendant with little or no formal training. When women do run into complications giving birth, the babies often die while the women seek medical care, the doctor said. The money will be used in Rehri Goth to eliminate malnutrition among expectant and new mothers and their babies, ensure that children have access to primary health care and immunizations and train a group of local women at Aga Khan University to become midwives. Women taking part in the program would get two medical checkups to monitor their pregnancy, multivitamins to promote a healthy fetus and food if they are malnourished, she said. Zaidi has been working in the area for the last ten years on various health-related research projects carried out by the university so she was familiar with its needs. He added that he and his wife conceived of the prize after they gave birth to triplets who spent a month in an intensive care unit. The prize, which Caplow said would continue next year, was a way to address the disparities in medical technology available around the world.